Hu sheep originated from Mongolian sheep. They are distributed in the Zhejiang Jiangsu provinces of China and the suburbs of Shanghai. 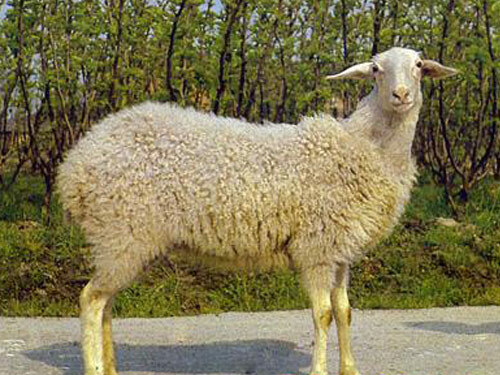 Hu sheep are well recognized for their beautiful wavy lambskins, early sexual maturity, aseasonal breeding, prolificacy, and the adaptability to a hot and humid climate. Hu sheep are raised indoors all year round. The lambskins taken from lambs slaughtered within the day of birth have distinctive wave-like stripes which are still retained after processing. Hu sheep lambskins are traditional export item of Zhejiang and Jiangsu provinces. The first estruses in ewes occur at the age of 4-5 months. Rams are capable of mating at the age of 4 months. Ewes cycle all year round. The average ovulation rate is 2.38 with higher ovulation rate of 2.60 in autumn and lower rate of 2.2 in spring. Under normal conditions, ewes lamb twice a year with litter size 2-3 lambs in most cases, and 7-8 lambs occasionally.